This morning I found myself in a reflective mood thinking back to mid-July 2008 and one of the most hectic weekends of my life. I blogged about it at the time and recommend you give it a quick look over before proceeding with this post. You can read my original account by following this link. In the post I linked above, I made a short reference to a meeting I attended on that Saturday. Today, the only reason I remember anything about that weekend is centered on that meeting, why I was there, and how I got there and back without missing a milking shift. I was serving as the chairman of the Alabama Farmers Federation's Young Farmers Committee at the time. My committee's goal that year was to eliminate a couple of old contests and reallocate resources towards new contests and programs we thought would help attract and develop new YF members at the county level. Though we were convinced this was the right move for our program's future, we expected a lot of resistance. These contests, the Miss Alabama Agriculture Pageant and Talent Find, had provided entertainment at county and state annual meetings for years and were considered to be "sacred cows" by many of our members. Getting our county YF chairmen on board with the proposed change wasn't difficult. Many of them were fed up with these old programs and ready to move in a different direction. The trick was going to be convincing the Federation's Board of Directors and County Presidents that this was in the best long-term interest of our whole organization, not just the Young Farmers program. After briefing the Board at its June meeting, I was given the green light to address the County Presidents at their conference in July. The Board would weigh their input and then make a final decision later on in the year. The problem was I couldn't attend that July meeting. My father (then our county president) was already registered to attend, and our farm labor situation was such that we could not both be away from the dairy at the same time. Driving down and back in between milking shifts was out of the question since the conference was being held nearly 300 miles away in Point Clear. About a week before the conference, our Young Farmers director and I began discussing how best to deliver my committee's proposal without me actually being there. I can't remember for sure, but I think we were settling on the idea of him clicking through a PowerPoint while I talked via teleconference. Toward the end of our conversation he asked if there was any way at all I could make the trip down to Point Clear and deliver the presentation in person. I jokingly replied, "Not unless your bosses will sign off on sending the company jet up here to shuttle me back and forth." About an hour later my YF director called me back and told me his bosses had indeed signed off on it. So that Saturday I met the plane in Hamilton after the morning milking and flew down to Point Clear (a 45-minute flight versus a five-hour drive). I presented my committee's recommendation and...to my great relief...received near unanimous support from the County Presidents. I was flown back to Hamilton and was milking cows by 1:30pm. The Board officially accepted our recommendation later that Fall and the final Miss Alabama Agriculture Pageant and Talent Find contests were held at our Annual Meeting in December. 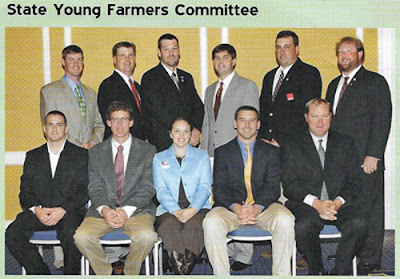 In the ten years since, our organization has grown participation in Young Farmers events and developed a deep roster of strong future leaders. And while my committee's efforts in 2008 probably won't be remembered by anyone who wasn't directly involved, I like to think we played a part in paving the way for the good things that were to come. If nothing else, the experience helped prepare me for the leadership roles I've held since. And for that I'll always be grateful.